The famous domestic actor of the twentieth century, Yuri Nikulin, and after death remains the most beloved among the audience. His films are still watched by people of different ages. And so that memories in the hearts of people remain for a long time, fifteen years ago they built a composition to a great actor in front of the Moscow Circus. Nikulin is depicted standing here on the ground. The opening of the facility took place on September 3, 2000. The place was chosen in front of the circus, because the artist has worked in it for more than fifty years. The composition is represented by a figure of Nikulin, made in bronze, and a car standing nearby. He is familiar to everyone from the film about the “Caucasian Captive”. The actor is dressed in a small jacket taken from a clown suit, tie and hat in the form of a boater. The car was also poured from bronze, but its size is less than a real car. Instead, the number has the inscription Yuri Nikulin. The sculpture was created by artist Alexander Rukavishnikov. There were many ideas for composition, but we decided to dwell on this one in order to connect both the cinema and the circus. The construction of the monument was erected for two years. 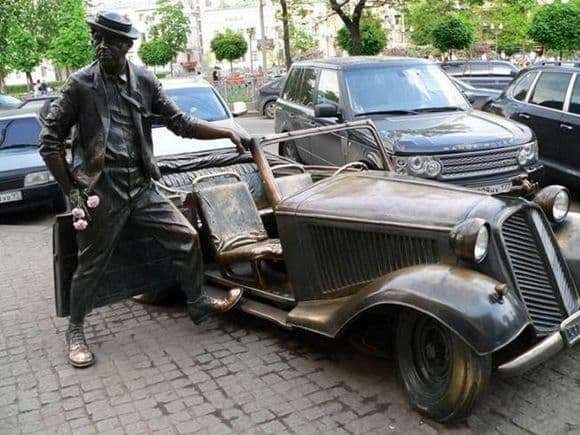 A convertible was cast in Minsk, and the artist’s statue had to be performed in Italy because it is more labor-intensive in structure. The construction weighs three and a half tons. The organizers of the circus Y. Nikulin funded this work; the total cost of the sculpture was three hundred fifty thousand American dollars. On the opening day the building was donated to the capital. The composition is on the pedestrian zone. For fifteen years of existence of this composition, the inhabitants of the city laid down several legends. All of them are based on the fact that the monument will bring happiness to people. But for this it is necessary, for example, to rub Nikulin’s nose well. Some also suggest rubbing a piece of clothing. Sometimes they say that there will be good luck if you sit in a cabriolet. Because of this, after so many years, the sculpture glitters as polished.